Congratulations to the First Unitarian Church of Salt Lake City, Utah, our newest Cool Congregation! First Unitarian was nominated by Elaine Emmi of Utah IPL, who praised the congregation for developing an “amazing program that involves more than just their faith community.” This program has developed with the support of Rev. Tom Goldsmith and the church’s Environmental Ministry Team, and it has a strong foundation in the church’s educational efforts, which include discussions and lectures, movie screenings, workshops, book groups, and other events that inform both church members and the wider community about a variety of environmental issues. 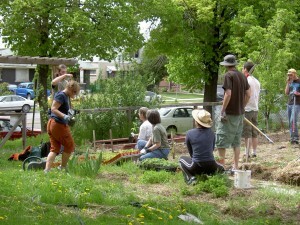 Members of First Unitarian Church in Salt Lake City, UT, put their faith into action on a workday in the church's community garden. First Unitarian’s educational programs not only inform their members about the importance of environmental issues; these programs also provide congregants with a strong foundation for faith-based action. Joan Gregory, the current coordinator of the Environmental Ministry, explains that classes such as the Northwest Earth Institute Course that inspired her to join the ministry provide a “common grounding in environmental topics that serves as a basis for future actions.” This action begins in the church itself with programs such as a community garden, recycling and composting, and even pursuing LEED certification for the church’s new sanctuary. First Unitarian’s faith-based also extends beyond church walls with advocacy that takes shape on a number of levels. In June, congregants worked to pass an Action of Immediate Witness (AIW) at the General Assembly of the Unitarian Universalist Association to mobilize Unitarians across the country to support America’s Red Rock Wilderness Act. This national legislation would permanently protect more than 9 million acres of wilderness-quality land in Utah from drilling and mining, off-road vehicle damage, and other threats. The church’s efforts to pass this AIW reflect the deep, spiritual connection that many congregants feel to their local lands. Gregory explains that these lands are “deeply cherished by people from many different spiritual traditions as places of inspiration, connection and renewal.” Congressional hearings for the Red Rock Wilderness Act are expected to occur this month. First Unitarian also encourages its members to confront difficult questions about the nature of environmental advocacy. In January, the church hosted a discussion about the role of civil disobedience. This event was prompted by the bold actions of Tim DeChristopher, a participant in First Unitarian’s Environmental Ministry Team who put himself on the line last December to protect Utah lands from oil and gas drilling. DeChristopher will face a trial this month on felony counts of disrupting a government auction, and he could receive up to 10 years in prison and $750,000 in fines for actions that stemmed from his deep moral conviction about the urgency of our climate crisis. First Unitarian’s program provided support for DeChristopher as well as a forum for the community to discuss his actions and the nature of our responsibility as people of faith to protect creation. Congratulations again to First Unitarian Church of Salt Lake City, a congregation committed to both educating their community about climate change and encouraging members to act to protect creation. The church’s comprehensive and challenging creation care program has earned First Unitarian the title of a Cool Congregation!